A longshot pick in the next to last mandatory race at the 10-person Final Table propelled Scott Coles to the front of a tight leaderboard en route to winning the 20th NTRA National Horseplayers Championship (NHC) Presented by Racetrack Television Network, STATS Race Lens™. 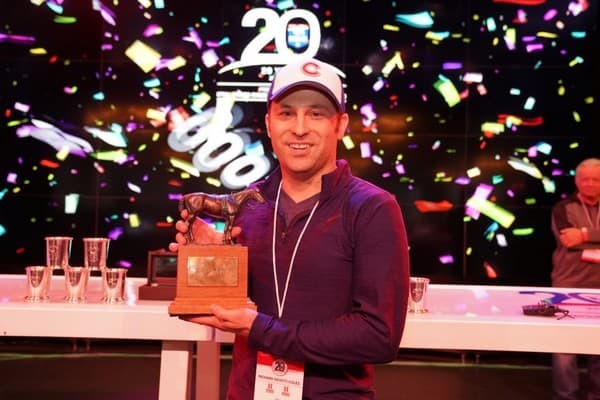 The 34-year-old Coles toppled an NHC field that had 668 entries, second largest in NHC history, and 522 individual players to become the tournament’s youngest ever champion and earn the Eclipse Award as Horseplayer of the Year. 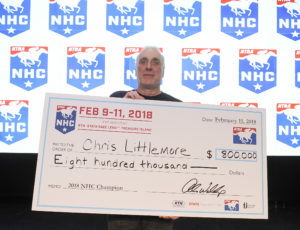 Chris Littlemore, a retired autoworker from Whitby, Ontario, Canada, was never seriously threatened throughout the Semifinals and the Final Table, cruising to an $800,000 first-place prize and an eclipse Award as Horseplayer of the Year at the 19th NTRA NHC Presented by Racetrack Television Network, STATS Race LensTM The NHC had a record field size of 702 entries (568 individual players) and offered a record overall cash and prizes totaling $2,974,700. I didn’t feel that confident, Littlemore said of entering Day 3 as the leader. I didn’t like the card that well. I didn’t like the races. I got lucky that a lot of chalk came in and kept me on top. I kept my distance. As the day wore on, I wasn’t having a good day, so I just kept picking away, picking away. I was fortunate enough that no big long shots came in to overtake me, and I picked the right horse int he last and it got me through. Ray Arsenault became the third Canadian to capture horse racing’s most prestigious handicapping contest when he defeated 654 entries at th 18th NHC held at Treasure Island Las Vegas. Arsenault, a 64-year old transportation broker used his methods of searching out long shots and value horses to take the tournament lead on day two. He never looked back during Sunday’s semifinal round and at the Final Table of 10 players, entering as the leader and continuing to win with long shots. I played the same way I always play, he said, I rarely play a horse under 5-1 and I love playing bombs because the feeling of hitting a longshot is just great. Today I happened to hit a few. I cut my teeth when I could barely walk, he said. My dad would go to Greenwood all the time and I’d tag along. I’d look for programs on the ground so I could sell them to the guys coming in for the last two races. This is it. This is like the Super Bowl of horse racing. Paul Matties, Jr. of Ballston Spa, NY topped a field of 629 entries to win the $800,000 first-place prize and an Eclipse Award as Horseplayer of the Year. The 46-year old Matties amassed a winning score of $399.50 over the 3 day tournament from 53 mythical $2 Win and Place bets. Horseplayers always think they’re smarter and better than everybody else so to beat all the smartest people in the world, what an honor. John O’Neil, 74, of Huntington Station, NY collected a winning score of $327.20 over the three-day tournament from 47 mythical $2 Win Place bets. O’Neil was the NHC two-day leader at the end of Saturday’s races but lost the lead toward the end of the Final 50 contest that led to the Final Table. In the seven mandatory races that made up the Final Table, however, O’Neil cashed in four of them. My brother took me one day when I was 14 or 15 and I’ve been doing it every day since…It’s been a journey to get here, believe me. This probably makes me even after a lifetime. Jose Arias, a 36-year-old environmental safety engineer from Bell Gardens near Los Angeles, put up a record two-day total after taking the lead late on Day 1. On the third day of the competition held off all challengers, proceeding to the first ever NHC Final Table. Horseplayers are a wonderful group of people. I see a lot of those same people at Santa Anita and going around tot different tournaments. It was wonderful getting that support, having people text me “get ready,” or “you can do it.” It was a very memorable experience feeling all the love and support from everybody there. When they started chanting my name after I won – that was the cherry on top. It was very emotional. I felt all this gratitude. Jim Benes, professional horseplayer, of Countryside, IL amassed a winning score of $268.40 from 28 mythical $2 Win and Place wagers and two mythical $4 Win and Place “Best Bet” wagers over the two-day tournament. Benes, who qualified for the NHC at Hawthorne Race Course, was in second place at the conclusion of Day 1, and stay at or near the top of the pack throughout Day 2. My mother passed away a few years ago…Her name was Mary, and when they were coming down the stretch of that last race and I heard a horse named Hail Mary on the lead, I wasn’t sure whether it was my mom trying to tell me ‘I’m here for you’ or ‘You should have bet on me!’ The only other thing I have been able to think of since then is my 9-year-old daughter. She’s going to be really happy and really proud of me when I get home. Michael Beychok became the first and only person to win $1 million at the NHC when he won the 13th DRF/NTRA NHC by one dollar on the last race in the contest. Beychok, a 48-year-old political consultant from Baton Rouge, LA, finished with a final score of $238.60 to rally past Dave Flanzbaum. I’ve never actually won a tournament before. I’ve had seconds and thirds, so I guess I picked the right time to win one. John Doyle, a 49-year-old former IBM account executive from Scottsdale, AZ, who retired to become a professional horseplayer, topped 300 other contestants to win the $500,000 first-place prize and title of 2010 Horseplayer of the Year at the 12th annual DRF/NTRA NHC at Red Rock Resort. I know people will say I’m crazy, but I believe visualization – I pictured myself getting the big winner’s check, and I pictures myself receiving the Eclipse Award. It worked for me. Brian Troop, 61, of Barrie, Ontario won the $500,000 first-place prize and title of Horseplayer of the Year at the 11th annual DRF/NTRA NHC. Troop amassed a winning score of $266 from 30 mythical $2 win-and-place wager over the two day tournament held at Red Rock Resort. After putting up an NHC record score of $232.60 on Friday, he proved best in a field of 300 handicappers who earned their seats in the NHC XI finals in qualifying tournaments over the past year. I’m basically a win bettor looking for prices. I think that’s a main reason why I have done well at the NHC where scoring is based on $2 win and place prices. John Conte, a veteran public handicapper from Oceanside, NY won the $500,000 first prize for topping a field of 302 at the DRF/NTRA NHC held at Red Rock Resort. Conte, author of the Grass is Greener turf selections that have been a staple in New York papers for many years, won the contest on a race taken off the grass. Going into the final race of the contest, Conte eventually found himself in 11th-place and in need of one more winner, a longshot, in order to pass the 10 players in front of him and give him the championship. My whole life has been a series of wouldas, couldas, shouldas, but I finally made it to the winner’s circle. Richard Goodall, a retired attorney based in Las Vegas, NV, won the ninth DRF/NTRA NHC in runaway style. Goodall’s final bankroll was $272.30, resulting in a record-setting margin of victory of $76. My goal when I started the tournament was to double my bankroll with an ultimate goal of getting to 220 points. After the first day I was at $149 and I was determined not to get conservative on the second day. Stick to what got me here. Demand value. Play horses 10-1 or higher. Stanley Bavlish, 54, of Virginia Beach, VA, won the $400,000 first-place prize in the DRF/NTRA NHC held at Bally’s. Bavlish scored $189.20 points – the lowest winning total in the eight-year history of the NHC – from making 15 mythical $2 win-and-place wagers each day of the two-day tournament with eight being mandatory races that everyone has to play and the other seven being optional. Prizes were capped at $42 to win and $22 to place. The key to winning a tournament is having your horses come in. I’m just lucky my horses came in today. Ron Rippey, longtime public handicapper for the Newark Star-Ledger, captured the $540,000 DRF/NTRA NHC. Rippey, 61, of Wayne, NJ earned his way into the national tournament by finishing second in a qualifying event at Autotote/Sports Haven on September 24. he won the national final and top prize of $250,000 with contest earnings of $237.20, an $8.60 winning margin. Rippey hit a 17-1 shot named Alluring Bel in the 10th race at Santa Anita, last race of the tournament, to vault into the lead of the 224-person competition. This is a lesson for people to never give up. I made a lot of mistakes yesterday and today, but I was able to survive. I am a strong finisher. I don’t like to be out on the lead. The hardest thing in the world is to be in front. 2005 – Jamie Michelson, Jr.
Jamie Michelson, Jr. following in the footsteps of lifelong friend Steve Wolfson, Jr. and emerged victorious to win in the sixth annual DRF/NTRA NHC at Bally’s-Las Vegas. Michelson won the championship’s $200,000 grand prize and earned the title of Horseplayer of the Year just two years after watching Wolfson accomplish the same feat at NHC IV in Jan. 2003. Kent Meyer became the fifth winner of the DRF/NTRA NHC, topping a field of 261 players at Bally’s-Las Vegas. Meyer won first prize of $100,000 and earned the crown of Horseplayer of the Year for 2004. Meyer compiled a total of $238.40 based on mythical $2 win-and-place bets on 15 races per day on each day of the two-day contest. In total, Meyer had eight winners between $14.40 and $51.80, plus two additional seconds in the 30-race contest. 2003 – Steve Wolfson, Jr.
Steve Wolfson, Jr became the fourth Horseplayer of the Year with his victory in NHC IV at Bally’s-Las Vegas. Wolfson defeated a field of 213 players and claimed first prize of $100,000 with a final bankroll of $279.60. Wolfson leapt into contention in the contest with his play on Offlee Wild ($56.80 to win and $21.60 to place) in the Holy Bull Stakes at Gulfstream. Herman Miller jumped out to an early lead and never looked back on his way to victory over a field of 177 players in the third annual $212,000 DRF/NTRA NHC at MGM Grand in Las Vegas. Miller prevailed after a seesaw battle with several challengers to take first prize of $100,000. He hit nine winners in the 30-race tournament and scored a contest-winning bankroll of $205.30 despite missing a race and making only 14 of his 15 available plays on the first day of competition. Judy Wagner won the second DRF/NTRA NHC, defeating a field of 204 players and taking home a $100,000 grand prize in January 2001. She was in eighth place after day one of the contest and used a strong rally on day two to leap to the top of the leaderboard. Her final national bankroll of $237.70 based on $2 win and place wagers on 30 races from eight tracks was good for $7.30 margin of victory. Whoever would have thought someone who has been handicapping for such a short time could win? I’m absolutely thrilled. Steve Walker from Lincoln, NE, won the inaugural Daily Racing Form/NTRA National Handicapping Championship to become the National Horseplayer of the Year for 2000. Walker knocked out a field of 160 handicappers to win $100,000 at the MGM Grand in January 2000. He compiled a contest-winning bankroll of $305.40 based on 20 mythical $2 win and $2 place bets. It was all about winning. The $100,000 never really entered my mind.